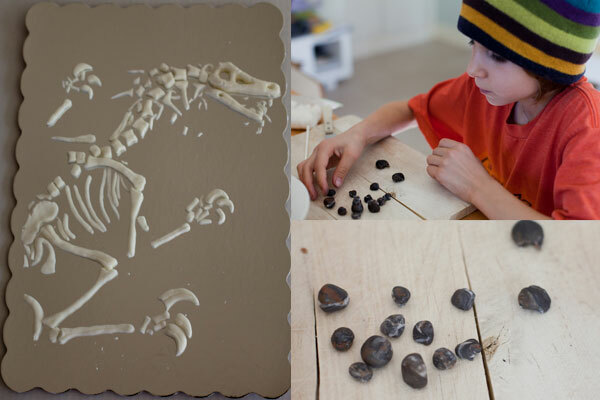 Rémy wants to be a paleontologist when he grows up and so for his birthday party be wanted the Best Dinosaur Birthday Party ever – it was all about fossils and paleontology. I booked 2 ‘paleontologist’ helpers and ordered a huge bunch of real fossils online (Google fossils) for the going home presents which arrived in a box from England. I still can’t get over spending less than $10 on something up to 350 million years old. 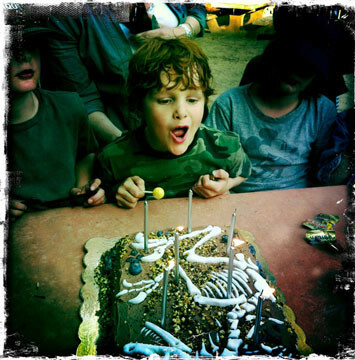 For the venue Rémy chose the park opposite Trails Cafe in Fern Dell, Griffith Park – “Because it has lots of trees and rocks to explore.” It turned out to be an excellent venue with lots of rocks to climb and dinosaur nests to excavate. I even managed to persuade Tomato Pie to deliver pizzas to us (it was Super Bowl Sunday which is probably one of their busiest days of the year). 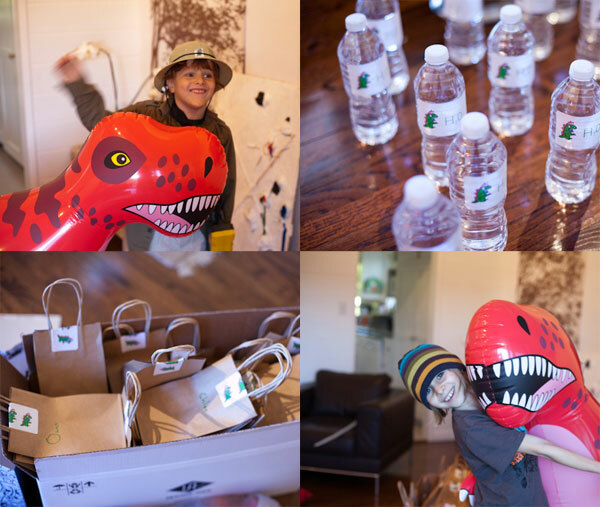 We made labels with a cute Tokidoki dinosaur and H2O for the water bottles and the going home bags. Coming up with a cake was tricky. 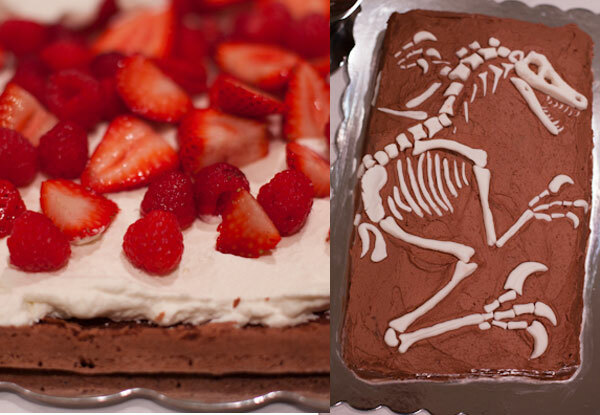 Rémy thought a to scale standing Spinosaurus cake would be perfect – skeleton or real thing was beyond my cake making skills. But I did think I could tackle a fossil – of a dinosaur. I switched to a velociraptor – it just looked better with those talons and skinny arms! A couple of days before I sat up late into the night making the bones out of white fondant having printed out a picture of a fossilized raptor to copy. Minty is the Queen of Fondant – she asked to make the stones – and boy oh boy did she do well – people at the party thought they were real! The day before the party I baked up not one but two flourless chocolate cakes. I used Joan’on Third’s chocolate roulade recipe and then used the cakes as layers with whipped cream and fresh berries between each layer rather than rolling it up. 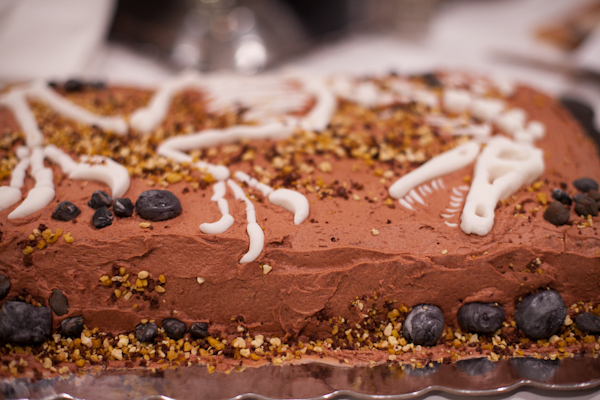 I covered the layered cake with a thin layer of chocolate buttercream frosting and stuck/embedded the bones into this. Then I covered this with a layer of sprinkles that I felt looked like rocks and dirt. Finally I surrounded the cake with over 60 very realistic looking stones and pebbles expertly made by Minty. 8 oz fine-quality bittersweet chocolate melted and then cooled to room temperature. 1. Preheat the over to 350 F. Line a large shallow baking pan with parchment paper, let paper hang over the ends. 2. Whisk the egg whites until you get soft peaks. Add half the sugar (1/2 cup) and beat until you get stiff silky peaks. Set aside. 3. Beat the egg yolks with remaining half of the sugar until thick and pale, about 5 minutes. 4. Add the melted chocolate and stir until incorporated. 5. Fold in one third of the beaten egg whites to lighten mixture then fold in the remaining two thirds being extremely gentle. 6. Spread cake batter into the baking pan and bake in the middle of the oven for 15 – 20 minutes, until the cake has puffed up and the top is dry. 1. Whisk cream with confectioners sugar and vanilla until it holds stiff peaks. Spread half of the whipped cream over the first cake. 2. Spread the berries out over the cream and then carefully place the second cake on top of the first – I found using a wooden board helped and then I slid the cake off it. 1. Cream the butter until white and fluffy in the electric mixer. 2. Sift together the powdered sugar and the cocoa powder and slowly add to the butter. 3. Add the cream and the vanilla and beat until light and fluffy. 4. Spread across the top of the cake in a thin layer and carefully work to the edges and down the sides. WOW!!! I am beyond impressed!! now coming from you that is a HUGE compliment because you know I am your biggest fan of all the cakes you have ever made. What a fun cake! How fun that he wants to be a paleontologist. I wanted to be an astronaut when I was his age! He’s really very serious about it – packed his bag and told me he was leaving home to go to the Gobi desert! Such a fun party idea for Remy!! Love the very special cake ~ you & Minty did a great job with that fondant. she has a talent – do you remember the Harajuku figures she made out of fondant for her birthday party? 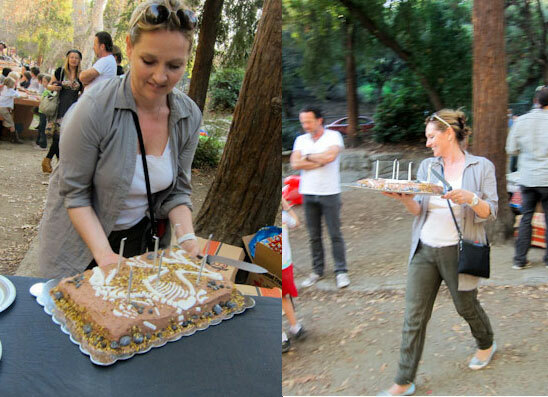 Wow, Lucy, that cake is amazing! It sounds like the party was a total smashing success! This is a little boy’s dream party! 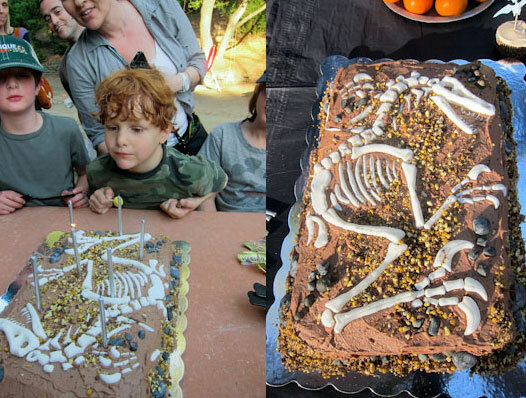 Great idea to use fondant for decorating the cake to look like dinosaur bones. This will surely be a birthday to remember! Let me know if you need extra tips! Thanks for kind words and good luck – and definitely buy the real fossils if you can!